The Republic of India (Hindi: भारत गणराज्य Bhārat Gaṇarājya), commonly known as India, is a country in South Asia. The name India is derived from Indus, which is derived from the Old Persian word Hindu, from Sanskrit Sindhu, the historic local name for the Indus River. The Constitution of India and common usage in Hindi also recognize Bharat as an official name of equal status. India is the seventh-largest country by area, the second-most populous country (with over 1.2 billion people), and the most populous democracy in the world. This population is remarkably diverse; it has more than two thousand ethnic groups, and every major religion is represented, as are four major families of languages. Further complexity is lent by the great variation of income and education. India is home to four major world religions, Hinduism, Buddhism, Jainism and Sikhism, whose spiritual patrimony has largely shaped the cultures of Asia. India boasts one of the great world civilizations, a glorious history replete with empires, commercial and cultural wealth, exceptional achievements in the arts, music and architecture, a complex and distinctive cuisine, and superb textiles. With the world's fourth largest economy in purchasing power and the second fastest growing large economy, India has made rapid progress in recent decades, especially in information technology. India's standard of living is projected to rise sharply in the next half-century, even as it battles high levels of poverty, persistent malnutrition, and persistent conflict with Pakistanis in contested areas like Kashmir. India is a founding member of the Non-Aligned Movement at the United Nations and has been a nuclear power since 1974. Although a socialist and heavily bureaucratic economy constrained its economic development through the 1980s, significant economic reforms beginning in 1991 have transformed India into one of the world's fastest-growing economies and an emerging superpower. India is the seventh-largest country in the world, with a total land area of 1,269,219 square miles (3,287,590 square kilometers). It is bounded on the southwest by the Arabian Sea and on the southeast by the Bay of Bengal. The Himalayas are to the north, while Kanyakumari constitutes the southern tip of the Indian peninsula. India borders Bangladesh, Bhutan, Burma, China, Nepal, and Pakistan. India constitutes the major portion of the Indian sub-continent, which sits atop the Indian Plate and the northwesterly portion of the Indo-Australian Plate. India's northern and north-eastern states are partly situated in the Himalayan Range. The rest of northern, central, and eastern India consists of the fertile Indo-Gangetic Plain. In the west, bordering southeastern Pakistan, lies the Thar Desert. Southern India is almost entirely composed of the peninsular Deccan Plateau, which is flanked by two hilly coastal ranges, the Western Ghats and the Eastern Ghats. The highest point is Kanchenjunga, at 22,208 feet (8598 meters). The third tallest mountain in the world, it lies on the border with Nepal. India has several major rivers, including the Ganges, the Brahmaputra, the Yamuna, the Godavari, the Kaveri, the Narmada, and the Krishna. India has three archipelagos — Lakshadweep, which lies off the south-western coast; the volcanic Andaman and Nicobar Islands island chain to the southeast, and the Sunderbans in the Ganges Delta of West Bengal. The climate varies from tropical in the south to more temperate in the Himalayan north, where elevated regions receive sustained winter snowfall. India's climate is strongly influenced by the Himalayas and the Thar Desert. The Himalayas, along with the Hindu Kush mountains in Pakistan, block cold Central Asian katabatic winds. This keeps the bulk of the Indian sub-continent warmer than locations at similar latitudes. The Thar Desert attracts the moisture-laden summer monsoon winds that, between June and September, provide most of India's rainfall. · Mehrgarh Culture · 7000–3300 B.C.E. Indus Valley Civilization 3300–1700 B.C.E. Late Harappan Culture 1700–1300 B.C.E. · Iron Age Kingdoms · 1200–700 B.C.E. Magadha Kingdom 1700 B.C.E.–550 C.E. · Maurya Dynasty · 321–184 B.C.E. Lying within the Indomalaya ecozone, India hosts significant biodiversity; it is home to 7.6 percent of all mammal, 12.6 percent of bird, 6.2 percent of reptile, and 6.0 percent of flowering plant species. Overall, 33 percent of Indian plant species are endemic. There are the tropical rainforests of the Andaman Islands, Western Ghats, and Northeast India, and the coniferous forest of the Himalayas. Between these extremes lie the sal-dominated moist deciduous forest of eastern India; teak-dominated dry deciduous forest of central and southern India; and the babul-dominated thorn forest of the central Deccan and western Gangetic plain. Important Indian trees include the medicinal neem, widely used in rural herbal remedies. The pipal fig tree, shown on the seals of Mohenjo-daro, shaded the Gautama Buddha as he sought enlightenment. Many Indian species are descendants of taxa originating in Gondwana, to which India originally belonged. Peninsular India's subsequent movement towards, and collision with, the Laurasian landmass set off a mass exchange of species. However, volcanism and climatic changes 20 million years ago caused the extinction of many endemic Indian forms. Soon thereafter, mammals entered India from Asia through two zoogeographical passes on either side of the emerging Himalaya. As a result, among Indian species, only 12.6 percent of mammals and 4.5 percent of birds are endemic, contrasting with 45.8 percent of reptiles and 55.8 percent of amphibians. 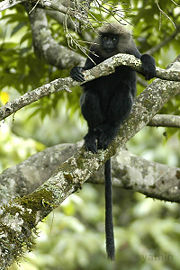 Notable endemics are the Nilgiri leaf monkey and the brown and carmine Beddome's toad of the Western Ghats. 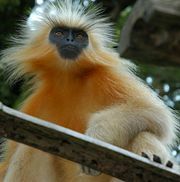 India contains 172, or 2.9 percent, of threatened species. These include the Asiatic lion, the Bengal tiger, and the Indian white-rumped vulture, which suffered a near-extinction from ingesting the carrion of diclofenac-treated cattle. Human encroachment has posed a threat to India's wildlife. In response, the system of national parks and protected areas, first established in 1935, was substantially expanded. 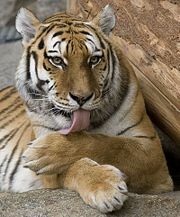 In 1972, India enacted the Wildlife Protection Act and Project Tiger to safeguard crucial habitat. Further federal protections were promulgated in the 1980s. Along with over 500 wildlife sanctuaries, India now hosts 14 biosphere reserves, four of which are part of the World Network of Biosphere Reserves; 25 wetlands are registered under the Ramsar Convention. Natural resources are coal (India has fourth-largest reserves in the world), iron ore, manganese, mica, bauxite, titanium ore, chromite, natural gas, diamonds, petroleum, limestone, and arable land. Natural hazards are droughts and flash floods, as well as widespread and destructive flooding from monsoonal rain, severe thunderstorms, and earthquakes. Environmental issues include deforestation, soil erosion, overgrazing, desertification, air pollution from industrial effluents and vehicle emissions, water pollution from raw sewage and runoff of agricultural pesticides. Tap water is not potable throughout the country; and a huge and growing population is overstraining natural resources. Mumbai, formerly known as Bombay, is the capital of the state of Maharashtra, the most populous city of India, and by some measures the most populous city in the world with an estimated population of about 13 million (as of 2006). Delhi is the second-largest metropolis. Located in northern India on the banks of the River Yamuna, The metropolis consists of three towns – Delhi, Delhi Cantonment, New Delhi – along with 214 villages. New Delhi was declared the capital after independence in 1947. As the seat of government, New Delhi houses offices of the federal government, and the Parliament of India. Paintings at the Ajanta Caves in western India. Isolated remains of Homo erectus in Hathnora in the Narmada Valley in Central India indicate that India might have been inhabited since at least the Middle Pleistocene era, or anywhere between 200,000 to 500,000 years ago. Evidence of Mesolithic culture throughout India, suggests widespread habitation covering a time span of around 25,000 years, starting around 30,000 years ago. Hunting, gathering, fishing, and other forms of hunter-gatherer subsistence seem to have dominated the period. However, early forms of herding and small scale farming have been detected. The first confirmed permanent settlements appeared 9000 years ago in Bhimbetka in modern Madhya Pradesh. By 5100 B.C.E., people in the Indus Valley were farming and harvesting Einkorn wheat, a primitive form of wheat. The irrigation of the Indus Valley, which provided enough resources to support urban centers such as Harappa and Mohenjo-daro around 2500 B.C.E., marked the beginning of the earliest urban society in India, known as the Indus Valley Civilization (or, the Harappan Civilization), which thrived between 2500 and 1900 B.C.E. The civilization is noted for its cities built of brick, road-side drainage system and multi-storied houses, and indicated uniformity of its measurement systems. The Mohenjo-daro ruins were once the center of this ancient society. Indus Civilization settlements spread as far south as present-day Mumbai, as far east as Delhi, as far west as the Iranian border, and as far north as the Himalayas. The Indus Civilization may have had a population of over five million. Over 2500 cities and settlements have been found. It is thought that the Indus Valley Civilizations depended upon the alluvial soils of the rivers, which produced high-yield crops. Around the middle of the second millennium B.C.E., the Indus River basin dried up, and the sites were abandoned. The origins of Vedic Civilization, which laid the foundations of Hinduism and other cultural aspects of early Indian society, are in dispute. Some scholars say there was an Indo-Aryan migration into the north-west regions of the sub-continent in the early second millennium B.C.E. brought the Vedic civilization. Early Vedic society was pastoral, but became agricultural. Several small kingdoms and tribes merged to form a few large ones, such as the Kuru and Pançala, some of which were often at war with each other. The principal texts of Hinduism (the Vedas), the great Indian epics (the Ramayana and Mahabharata) including the famous stories of Rama and Krishna are said to have their origins during this period, from an oral tradition of unwritten bardic recitation. The Bhagavad Gita, another primary text of Hinduism well-known for its philosophical nature, is contained in the Mahabharata. During the Iron Age, a number of small kingdoms or city states covered the sub-continent, many mentioned during Vedic literature as far back as 1000 B.C.E. 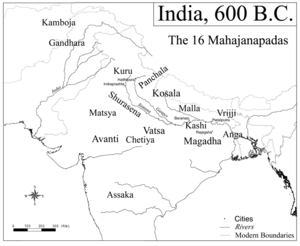 By 500 B.C.E., 16 monarchies and “republics” known as the Mahajanapadas—Kasi, Kosala, Anga, Magadha, Vajji, Malla, Chedi, Vatsa, Kuru, Panchala, Machcha, Surasena, Assaka, Avanti, Gandhara, Kamboja—stretched across the Indo-Gangetic plains from modern-day Afghanistan to Bangladesh, and many smaller clans mentioned within early literature seem to have been present across the rest of the sub-continent. The largest of these were Magadha, Kosala, Kuru and Gandhara. The educated speech at that time was Sanskrit, while the general population of northern India spoke Prakrits. Hindu rituals at that time were complicated and conducted by the priestly class. It is thought that the Upanishads, late Vedic texts, were composed early in this period. They had a huge effect on Indian philosophy, and were contemporary to the development of Buddhism and Jainism. It was in 537 B.C.E., that Gautama Buddha gained enlightenment and founded Buddhism, which was initially intended as a supplement to the existing Vedic dharma. Around the same time period, in mid-sixth century B.C.E., Mahavira founded Jainism. Both religions had a simple doctrine, and were preached in Prakrit, which helped it gain acceptance among the masses. While the geographic impact of Jainism was limited, Buddhist nuns and monks eventually spread the teachings of Buddha to Central Asia, East Asia, Tibet, Sri Lanka and South East Asia. The Mahajanapadas were roughly equivalent to the ancient Greek city-states of the same period in the Mediterranean, producing philosophy which would eventually form the basis of much of the eastern world's beliefs, just as ancient Greece would produce philosophy that much of the western world's subsequent beliefs were based on. The period effectively ended with the onset of Persian invasion, around the fifth century B.C.E., the Greek invasion, by the late fourth century B.C.E., and the subsequent rise of a single Indian empire from the kingdom of Magadha. In 321 B.C.E., exiled general Chandragupta Maurya overthrew the reigning king Dhana Nanda to establish the Maurya Empire. For the first time, most of the sub-continent was united under a single government. Chandragupta Maurya was influenced by the jainacharya Bhadrabahu and he adopted Jainism. He is credited for the spread of Jainism in southern Indian region. Chandragupta was succeeded by his son Bindusara, who expanded the kingdom over most of present day India, except Kalinga, and the extreme south and east, which may have held tributary status. Modern day India is an image of the Mauryana. The tradition was continued later by the Mughals and the British, who formed similar empires. Bindusara's kingdom was inherited by his son Ashoka The Great who initially sought to expand his kingdom. After carnage caused in the invasion of Kalinga, he renounced bloodshed and pursued a policy of non-violence, or ahimsa, after converting to Buddhism. The Edicts of Ashoka are the oldest preserved historical documents of India, and from Ashoka's time, approximate dating of dynasties becomes possible. The Mauryan dynasty under Ashoka was responsible for the proliferation of Buddhist ideals across the whole of East Asia and South-East Asia, fundamentally altering the history and development of Asia. From 180 B.C.E., a series of invasions from Central Asia followed, including those led by the Indo-Greeks, Indo-Scythians, Indo-Parthians and Kushans in the northwestern Indian sub-continent. The middle period, especially associated with the Gupta dynasty, is known as India's Golden Age, a time of unparalleled cultural development. The Kushanas invaded north-western India about the middle of the first century C.E., from Central Asia, and founded an empire that eventually stretched from Peshawar to the middle Ganges and, perhaps, as far as the Bay of Bengal. It also included ancient Bactria (in the north of modern Afghanistan) and southern Tajikistan. Their power also extended into Turkestan and helped spread Buddhism to China. In South India, several kingdoms emerged. The earliest of these is the Pandya Kingdom in southern Tamil Nadu, with its capital at Madurai. Around the same time in southern India, the Pandyan kingdom began to take shape. Ancient Indian science and technology, engineering, art, literature, astronomy, and philosophy flourished under the patronage of these kings. This period lasted roughly from the rise of the Satavahanas in 200 B.C.E., as the Mauryans declined, to the end of the Guptas, around the middle of the first millennium C.E, a span of 700 years, and ended with the onset of Huna invasion. India was the richest classical civilization, with the only known diamond mines in the world. Muslim trading communities had been flourishing throughout coastal South India, particularly in Kerala. Short-lived Islamic empires invaded and spread across the northern subcontinent over a period of a few centuries. Arabs, Turks and Afghans invaded parts of northern India and established the Delhi Sultanate at the beginning of the thirteenth century, from former Rajput holdings. The subsequent Slave dynasty of Delhi managed to conquer large areas of northern India, approximate to the ancient extent of the Guptas, while the Khilji Empire was able to conquer most of central India. Kanyakumari is the southernmost point in mainland India. 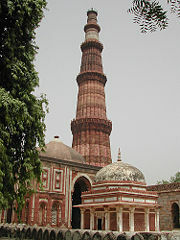 At 72.5 metres, the Qutub Minar is the world's tallest brick minaret. In 1526, Babur, a Timurid (Turco-Persian) descendant of Timur, swept across the Khyber Pass and established the Mughal Empire, which lasted for over 200 years. The Mughal Dynasty ruled most of the Indian sub-continent by 1600. It went into a slow decline after 1707 and was finally defeated during the Indian rebellion of 1857. This period marked vast social change. Some Mughal emperors showed religious tolerance, liberally patronizing Hindu culture, and some of whom destroyed historic temples and imposed taxes on non-Muslims. During the decline of the Mughal Empire, which at its peak occupied an area slightly larger than the ancient Maurya Empire, several smaller empires rose to fill the power vacuum or themselves were contributing factors to the decline. The Mughals had a policy of integration with Indian culture, which is what made them successful where the short-lived sultanates of Delhi had failed. Akbar the Great was particularly famed for this. Akbar, who was greatly influenced by Jain teachings, gave up non-vegetarian food. He rolled back Zazia Tax from Jain Pilgrim places like Palitana. Vasco da Gama's discovery of a new sea route to India in 1498 paved the way for European commerce with India. The Portuguese set up bases in Goa, Daman, Diu and Bombay. They maintained the longest trade-post for 500 years until 1962. The British established their first outpost in South Asia in 1619 at Surat on the northwestern coast of India. Later in the century, the British East India Company opened permanent trading stations at Madras, Bombay, and Calcutta, each under the protection of native rulers. The French set up base in the seventeenth century, and tried to occupy large parts of southern India. However, subsequent wars with the British led to the loss of almost all of their commercial posts. They did, however, retain the trade-posts of Pondicherry and Chandernagore. The French were expelled from Pondicherry in 1950. The Dutch maintained trade-posts in the towns of Travancore, but were more interested in Ceylon (now Sri Lanka) and the Dutch East Indies (now Indonesia). They were responsible for training the military of the princely state of Kerala. In 1845, the Danish trade-post of Tranquebar was sold to the United Kingdom. The British established a foothold in Bengal when British soldiers, funded by the British East India Company, and led by Robert Clive, defeated Nawab Siraj Ud Daulah in the Battle of Plassey in 1757, and plundered the Bengali treasure. Bengal became a protectorate, and then directly went under the rule of East India Company. The British East India Company monopolized the trade of Bengal. Bengali craftsmen were obliged to work for minimal pay and pay heavy taxes. The result was the famine of 1769 to 1773 in which 10 million Bengalis died, followed almost a century later by the Great Calamity period, in which up to 40 million Indians perished from famine amidst the collapse of India's native industries and skilled workforce. By the 1850s Britain controlled most of the Indian sub-continent, which included present-day Pakistan and Bangladesh. From 1830, the defeat of the Thugs, a secret society of murderers, played a part in securing greater control of diverse Indian provinces for the British. The Indian rebellion of 1857 in the north, led by mutinous Indian soldiers and known in British history as the Great Mutiny, was crushed by the British. Subsequently, all political power was transferred from the East India Company to the British Crown, which began to administer most of India directly. It controlled the rest through local rulers. 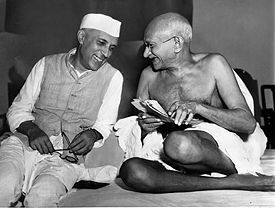 Jawaharlal Nehru sharing a joke with Mahatma Gandhi, Mumbai, July 6, 1946. The first step toward independence and western-style democracy was taken with the appointment of Indian councillors to advise the British viceroy, and the establishment of provincial councils with Indian members. The councilors' participation was subsequently widened in legislative councils. From 1920, Indian leaders such as Subhas Chandra Bose transformed the Indian National Congress, largely led by Mahatma Gandhi, into a mass movement to campaign against the British Raj. Finally, on August 15, 1947, India gained independence from British rule, but not before losing its Muslim-majority areas to the separate nation-state of Pakistan. Three years later, on January 26, 1950, India chose to be a republic, and a new constitution came into effect. Since independence, India has seen sectarian violence and insurgencies in various areas, but has maintained its unity and democracy. It has unresolved territorial disputes with China, which escalated into the brief Sino-Indian War in 1962; and with Pakistan, which resulted in wars in Indo-Pakistani War of 1947, Indo-Pakistani War of 1965, Indo-Pakistani War of 1971, and in 1999 in Kargil. India is a founding member of the Non-Aligned Movement and the United Nations (as part of British India). In 1974, India conducted an underground nuclear test. This was followed by five more tests in 1998. Significant economic reforms beginning in 1991 have transformed India into one of the fastest-growing economies and an emerging superpower in the world. The constitution defines India as a sovereign, socialist, secular, democratic republic. India has a federal form of government and a bicameral parliament operating under a Westminster-style parliamentary system. It has three branches of governance: the legislature, executive, and judiciary. The president, whose role is largely ceremonial, is elected by an electoral college for a five-year term. The prime minister, who is appointed by the president, and who is required to have the support of the party or coalition securing the majority of seats in the lower house, is the head of government and holds most executive powers. The executive branch consists of the president, vice-president, and the Council of Ministers (the Cabinet being its executive committee) headed by the prime minister. Any minister holding a portfolio must be a member of either house of parliament. The executive is subordinate to the legislature—the prime minister and council are directly responsible to the lower house. The legislature is the bicameral parliament, which consists of the upper house called the Rajya Sabha (State's Assembly), and the lower house called the Lok Sabha (People's Assembly). The 245-member Rajya Sabha is chosen by the state legislative assemblies—members have staggered six-year terms. Each state nominates members to the Rajya Sabha in proportion to the state's population. The Lok Sabha's 545 members are directly elected by popular vote for five-year terms. Indians have lived under the rule of law since ancient times. Hindu law was codified more than two thousand years ago. India's independent judicial system began under the British, and its concepts and procedures resemble those of Anglo-Saxon countries. The Supreme Court of India consists of a chief justice and 25 associate justices, all appointed by the president on the advice of the Chief Justice of India. In the 1960s, India moved away from using juries for most trials, finding them to be corrupt and ineffective. Instead almost all trials are conducted by judges. The judiciary consists of the Supreme Court of India, High Courts at the state level, and district and session courts at the district level. The legal system is based on the English common and statutory law. India accepts compulsory International Court of Justice jurisdiction with several reservations. For most of its democratic history, the Indian National Congress has ruled at the federal level, while national parties like Indian National Congress, Bharatiya Janata Party, communist parties and some regional parties have dominated state politics. Till 1990, Indian National Congress party enjoyed a parliamentary majority barring two brief periods during the 1970s and late 1980s. This rule was interrupted between 1977 and 1980, when the Janata Party won the election owing to public discontent with the Indian Emergency (1975-1977) declared by the then Prime Minister Indira Gandhi. The Janata Dal coalition, called the National Front, won elections in 1989, but its government managed to hold on to power for two years only. Between 1996 and 1998, there was a period of political flux with the government being formed first by the Bharatiya Janata Party followed by the United Front coalition. In 1998, the BJP formed the National Democratic Alliance with smaller regional parties, and became the first non-Congress and coalition government to complete a full five-year term. In 2004, the Indian National Congress won the largest number of seats to form a government leading the United Progressive Alliance, supported by a left-leaning coalition and parties opposed to the BJP. India took a leading role in the 1950s by advocating the independence of European colonies in Africa and Asia, and is one of the founding members of the Non-Aligned Movement. After the Sino-Indian War and the Indo-Pakistani War of 1965, India's relationship with the Soviet Union warmed at the expense of ties with the United States and continued to remain so until the end of the Cold War. India has fought several wars with Pakistan, primarily over Kashmir. India fought Pakistan over the liberation of Bangladesh in 1971. India has played an influential role in the Association of South East Asian Nations, and the World Trade Organization. India has long supported the United Nations, with over 55,000 Indian military and police personnel having served in 35 U.N. peace keeping operations across four continents. 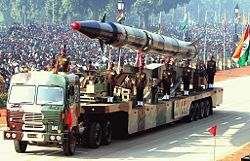 An Indian-developed Agni-II ballistic missile during a Republic Day parade held in 2004. India became a nuclear state in 1998 by successfully conducting underground nuclear tests. This was followed by international military sanctions that were gradually withdrawn after September 2001. Recently, India concluded a nuclear deal with United States that would allow the United States to supply civilian nuclear technology to India and nuclear fuel to Indian reactors. India has adopted a no-first-use nuclear policy. India maintains the third largest military force in the world. Auxiliary forces include the Indian Paramilitary Forces, the Indian Coast Guard, and the Strategic Forces Command. The president is the supreme commander. India is a union of 29 states and seven federally-governed union territories. All states, the National Capital Territory of Delhi and the union territory of Pondicherry have elected governments. The other five union territories have centrally-appointed administrators. 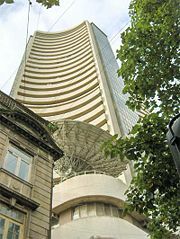 The Bombay Stock Exchange Sensex index reflects investor confidence in the Indian economy. For most of its democratic history, India adhered to a quasi-socialist approach, with strict government control over private sector participation, foreign trade, and foreign direct investment. However, since 1991, India has gradually opened up its markets through economic reforms by reducing government controls on foreign trade and investment. Forex reserves have risen from US$5.8-billion in March, 1991, to US$177-billion in January, 2007. The high level of foreign reserves acts as a cushion against external shocks. Privatization of publicly owned industries and the opening of certain sectors to private and foreign participation have continued amid political debate. With a gross domestic product (GDP) growth rate of 9.2 percent, the Indian economy is among the fastest growing economies in the world. But wealth distribution in India, a developing country, is fairly uneven, with the top 10 percent of income groups earning 33 percent of all income. India has a labor force of 509.3 million, 60 percent of which is employed in agriculture or agriculture-related industries. The service sector accounts for 54 percent of GDP. The agricultural and industrial sectors make up 28 percent and 18 percent respectively. Agricultural crops include rice, wheat, oilseed, cotton, jute, tea, sugarcane, and potatoes. Industries include automobiles, cement, chemicals, consumer electronics, food processing, machinery, mining, petroleum, pharmaceuticals, steel, transportation equipment and textiles. India has set up Special Economic Zones and software parks that offer tax benefits and better infrastructure to set up business. 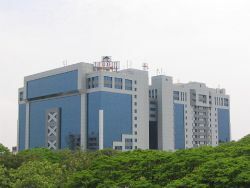 Pictured here is the Tidel Park in Chennai, one of the largest software parks in India. More recently, India has capitalized on its large pool of educated, English-speaking people to become an important outsourcing destination for multinational corporations. India has also become a major exporter of software as well as financial, research, and technology services. India's software exports are growing at the rate 30-35 percent per year. Economic expansion has helped New Delhi continue to make progress in reducing its federal fiscal deficit. However, strong growth - more than eight percent growth in each of the last three years - combined with easy consumer credit and a real estate boom is fueling inflation concerns. The huge and growing population is the fundamental social, economic, and environmental problem. Exports totaled $112-billion in 2006. Export commodities were textile goods, gems and jewelry, engineering goods, chemicals, and leather manufactures. Export partners were the United States 16.7 percent, United Arab Emirates 8.5 percent, China 6.6 percent, Singapore 5.3 percent, United Kingdom 4.9 percent, Hong Kong 4.4 percent. Imports totaled $187.9-billion in 2006. Import commodities were crude oil, machinery, gems, fertilizer, and chemicals. Import partners were China 7.3 percent, the U.S. 5.6 percent, Switzerland 4.7 percent. GDP (purchasing power parity) was $4042-billion, or fourth on the list of 227 nations listed by the World Fact Book. Per capita GDP (ppp) was $3320 or 122 on a list of 181 nations. Tribals make up eight percent of India's people. Pictured here are Apatani tribal women from Arunachal Pradesh. India is the world's second-most populous country. This population is remarkably diverse; it has more than two thousand ethnic groups, and every major religion is represented, as are four major families of languages. Further complexity is lent by the great variation of income and education. Although India occupies only 2.4 percent of the world's land area, it supports over 16 percent of the world's population. Almost 40 percent of Indians are younger than 15 years of age. More than 70 percent of the people live in more than 550,000 villages, and the remainder in more than 200 towns and cities. In recent decades, migration to larger cities has led to the exponential rise in the urban population. India's largest urban agglomerations are Mumbai, Pune, Kolkata, Delhi, Chennai, Bangalore and Hyderabad. Life expectancy at birth for the total population was 64.71 years in 2006. Ethnic groups in India comprised, in 2000, Indo-Aryan 72 percent, Dravidian 25 percent, Mongoloid and others three percent. Although India has had ethnic conflict, and religious wars, in most areas there is a local inter-caste and intertribal economy that lessens ethnic conflict. 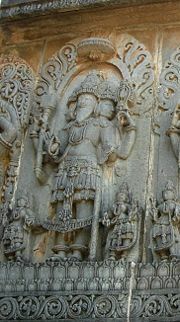 Temple carving representing Brahma or God as Creator (not to be confused with Brahman). Religious practices are an integral part of everyday life and are a very public affair. Although 80.5 percent of Indians report themselves as Hindus, India's Muslim population is the world's second largest, and they constitute 13.4 percent of the population. Other religious groups include Christians (2.3 percent), Sikhs (1.9 percent), Buddhists (0.8 percent), Jains (0.4 percent), Jews, Zoroastrians, Bahá'ís and others (0.7 percent). Hinduism is the original religion of India, which today counts approximately 900 million adherents. Out of Hindu culture arose three other major religions: Buddhism, Jainism, and Sikhism. Buddhism first flowered in India but then suffered decline, while it flourished in Sri Lanka, China, Japan and Southeast Asia. Jainism and Sikhism remain rooted in Indian soil. Hinduism is often considered a way of life. It arose during the period 2000-1500 B.C.E. Hinduism differs from many religions in not having a single founder, a specific theological system, a single system of morality, or a central religious organization. The religion is ideologically tolerant and inclusive—qualities which have enabled it to co-exist with other religions over its long history. Its main holy books are the Vedas and the Upanishads. Hinduism's greatest contribution to humanity is its teachings on personal self-cultivation through the disciplines of meditation, yoga and ascetic practice. Their goal is to experience liberation, unity with the divine and unity with all things. These paths of effort are rooted in the knowledge that God—or the realm of the holy—is not merely conceptual, but should be experienced. They are appreciated throughout the world by believers in many faiths. Another of India's salient religious contributions to humanity is the doctrine of non-violence, or ahimsa; that one should avoid doing harm to any living thing. This was first taught in Jainism, and today is also practiced by many Hindus and Buddhists as well, who live as strict vegetarians, avoid injuring animals, and of course refrain from harming other human beings. Hinduism, Buddhism and Jainism teach respect for the environment, as seen notably in the Hindus' respect for the cow, which is revered as sacred. The Indian religions teach reincarnation, the basic idea that one's soul can be reincarnated an endless number of times. What the soul is reincarnated into depends on the balance of one's sins and good deeds. This belief has been criticized for providing justification for the inequalities of the caste system. Whether a person is born into a high or low caste is a result of the accumulated virtues or sins of one's soul in a previous life; therefore one should accept ones' caste as something fated within a cosmic order that is ultimately just. However, in Buddhism and in the bhakti traditions of Hinduism, the way to liberation is open to all people regardless of caste or social status. Buddhism in particular rejects the caste system, and Buddhist missions serve many Indians of the lowest castes. India hosts thousands of rituals and millions of shrines, temples, and other holy places. Hindus have large pilgrimage temples, Muslims have tombs of saints, and Buddhists revere sites associated with Buddha. Zoroastrians are noted for their Towers of Silence, which are stone structures where in former times corpses were exposed to be eaten by vultures (Zoroastrians today bury their dead). Hindus cremate their dead on a pile of logs, although the poor may bury their dead. Saintly figures may be buried in a sitting position. Traditional Indian family values are highly respected, although urban families now live as nuclear families. The traditional Indian family is patriarchal. It is said that a woman must first obey her father, then her husband, and then her son. The opinion of the male head of household is important in arranging marriages. The arranged marriage it still is widely practiced, except among the urban middle classes. Non-arranged marriages are called "love marriages," and are regarded as impulsive acts of passion. Rules of consanguity differ regionally: In north India, the man cannot marry a closely related cousin. In the south, the mother's brother's daughter or the father's sister's daughter is the ideal spouse, and uncle-niece marriage is permitted. The residential unit may house a large extended family of three or four generations or a lone widow. In large city buildings, there may be a number of households using a common cooking hearth. Traditionally, sons inherit property and status from their fathers and daughters receive a dowry when they marry, although there is much local and caste variation in who inherits. Mothers, older siblings, and grandmothers care for infants. When the mother works, a grandmother provides daytime care. After the age of two, older sisters care for infants. The ownership of land is the key to survival and power in the traditional agricultural economy. Middle-ranking politically dominant castes own most of the land. Traditions of land tenure and taxation vary through the regions. Rural serfs, people who were owned with the land upon which they worked, who for centuries did the basic farm labor, existed until the 1990s. These days there are numerous landless wage laborers, tenant farmers, landlords who rent out their extensive lands, and rich peasants who work their own holdings. In India, there are 1652 languages and dialects in total, 216 of these have more than 10,000 native speakers. The largest of these by far is Hindi with some 337 million (the second largest being Telugu with some 80 million). The Indian constitution recognizes 23 official languages. Hindi and English are used by the government for official purposes, wherein Hindi has a rightful priority. Sanskrit and Tamil enjoy classical language status in India. India's caste system is unique. Castes so fragment society that there can be 20 or 30 distinct castes within a village. The caste is the largest kin group, the social unit within which whose members marry, and which has its own traditional occupation and rank. It is made up of a number of intermarrying clans. There are several thousand castes. An individual cannot change his or her caste affiliation. Every family belongs to only one named caste. Each caste has developed a subculture that is handed down through the generations. Hindu religious theory justifies the division of society into castes, with the differences in status and access to power. “Brahmins,” who were traditionally priests and intellectuals, make up the highest category of castes. Below them were “Ksatriya,” including warriors and rulers. The “Vaisyas,” were ranked third. They were concerned with trading and land ownership. The fourth-ranking “Sudras,” were farmers. Below these were many "untouchables," called “Pancama” or Dalit. Several hundred tribes, with varied subsistence patterns, existed outside the caste system. The caste system displayed large differences in status and power, and relative degrees of spiritual purity or pollution. In the major cities, the caste system has been displaced, and inter-caste marriage is becoming common. Indian Muslims, Buddhists and Christians are freed from the theological fetters of caste; however, they may still be subject to discrimination. The Taj Mahal, viewed from the Northern bank of Yamuna river. Mark Twain wrote: "India is the cradle of the human race, the birthplace of human speech, the mother of history, the grandmother of legend, and the great grand mother of tradition. Our most valuable and most astrictive materials in the history of man are treasured up in India only!" India's culture is marked by a high degree of syncretism. It has managed to preserve established traditions whilst absorbing new customs, traditions, and ideas from invaders and immigrants. Many Indian cultural practices, languages, customs, and monuments are examples of this co-mingling over centuries. Famous monuments, such as the Taj Mahal and other examples of Islamic-inspired architecture, have been inherited from the Mughal dynasty. These are the result of traditions that combined elements from all parts of the country. The cuisine of India is extremely diverse, as ingredients, spices and cooking methods vary from region to region. Rice and wheat are the nation's main staple foods. Muslims, Jews, Sikhs, and Christians all eat meat, with the important proviso that the first three groups do not consume pork. Lower-caste Hindus eat any meat except beef, whereas members of the higher castes and all Jains are normally vegetarian, with most even avoiding eggs. The country is notable for its wide variety of vegetarian and non-vegetarian cuisine. 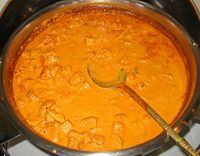 Spicy food and sweets are popular in India. Traditional Indian dress greatly varies across the regions in its colors and styles, and depend on various factors, including climate. The most common male attire consists of the dhoti and kurta, worn in most of the western and central regions. A sherwani is typically worn for special occasions. Men of northern India and the Punjab may also wear salwar kameez, often in plain white cotton, and top the kameez with a dark waistcoat. The lungi (a type of wrap-around) is worn in many parts of India, but depending on the social practices of the region it may be restricted to indoor-wear. As with women's clothing, jeans and other types of Western-wear are common in urban areas and smaller towns. Shirts and pants are ubiquitous in cities and towns. Women may wear a sari, a length of material usually wrapped over a petticoat and a choli, or bodice. Different regions have different styles of wrapping the sari. Sometimes the sari is only worn as festive attire, with Western clothes worn day-to-day, but there still are many women, (particularly villagers and elderly women) who wear a sari on a daily basis. The end of the sari may be used to cover the head, in temples or in the presence of elders. The Indus Valley Civilization was characterized by well-planned cities and houses. During the Gupta and Maurya empires, several Buddhist architectural examples like caves of Ajanta and Ellora Caves, and the monumental Sanchi Stupa were built. South India contains several Hindu temples like Brihadeeswara Temple, Thanjavur, the Sun Temple, Konark, Sri Ranganathaswamy Temple at Srirangam, and the Buddha stupa at Bhattiprolu. Muslims brought the Fatehpur Sikri, Taj Mahal, Gol Gumbaz, Qutub Minar, and the Red Fort of Delhi. British colonial rule brought the Indo-Saracenic style, and the mixture of other styles, such as European gothic. Victoria Memorial, and Victoria Terminus are notable examples. Recent creations such as Lotus Temple, and the various modern urban developments, are also notable. The traditional system of Vaastu Shastra serves as India's version of Feng Shui, influencing town planning, architecture, and ergonomics. It is unclear which system is older, but they contain many similarities. Though Vastu is conceptually similar to Feng Shui in that it tries to harmonize the flow of energy, (also called life-force or Prana in Sanskrit, through the house, it differs in the exact directions in which various objects, rooms, materials etc are to be placed. The spread of ideas associated with Buddhism meant Indian architecture influenced eastern Asia. A number of Indian architectural features such as the temple mound or stupa, temple spire or sikhara, temple tower or pagoda and temple gate or torana, have become famous symbols of Asian culture, used extensively in East Asia and South East Asia. The central spire is also sometimes called a vimanam. The variant southern temple gate, or gopuram is noted for its intricacy and majesty. The arch, a cornerstone of world architecture, was developed by the Indus Valley civilization and would later be a staple of Indian architecture. There are eight types of towns and cities in India. There are ancient pilgrimage centers (Madurai), local market towns, medieval fortified towns (Gwalior), ancient and medieval seaports (Bharuch), military cantonments set up by the British (Pune), modern administrative centers (New Delhi), new industrial centers (Jamshedpur), and modern metropolitan areas, such as Mumbai and Kolkata. Architecture styles reflect the influence of the medieval Tamil kingdoms, Persian and Turkic invaders in the north, Portuguese and British Christianity, and all the distinctive features of the religious monuments of Jainism, Buddhism, Islam, and medieval Hinduism. There are about 550,000 villages. Each region has its own architecture and village layout. India has been a seat of learning for thousands of years. While the country has some of the best universities, technical institutes and medical schools in the world, it has challenges in its primary education and is yet to reach 100 percent literacy. Universal compulsory primary education, with its challenges of keeping poor children in school and maintaining quality of education in rural areas, has been difficult to achieve. All levels of education are heavily subsidized by the government, though there is a move to make higher education partly self-financing. The system is divided into pre-primary, primary, middle, secondary (or high school), and higher levels. Pre-primary is composed of lower and higher kindergarten, where primary reading and writing skills are developed. Primary school includes children of ages six to 11, and is organized into classes one through five. Secondary school pupils aged 11 through 15 are organized into classes six through 10, and higher secondary school students ages 16 through 17 are enrolled in classes 11 through 12. In some places there is a concept called middle schools for classes between six to eight. In such cases classes eight to 12 are classified under high school category. Higher education provides an opportunity to specialize in a field and includes technical schools (such as the Indian Institutes of Technology), colleges, and universities. At the time of India's emergence as a nation-state in 1947, India's literacy rate was 11 percent. Since then, it has increased to 68.6 percent (58.25 percent for females and 78.8 percent for males). The state of Kerala has the highest literacy rate (91 percent). Bihar has the lowest (47 percent). 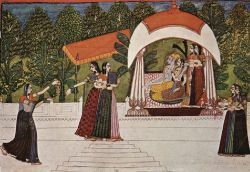 An eighteenth century Rajput painting. The earliest Indian paintings were the rock paintings of pre-historic times, the petroglyphs as found in places like Bhimbetka, and some of them are older than 55,500 B.C.E. Ancient texts outline theories of darragh and anecdotal accounts suggesting that it was common for households to paint their doorways or indoor rooms where guests resided. 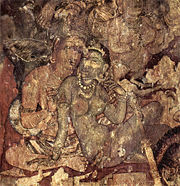 Cave paintings from Ajanta, Bagh, Ellora and Sittanavasal and temple paintings testify to a love of naturalism and God. Most rock art in India is Hindu or Buddhist. A freshly made colored floor design (Rangoli) everyday is still a common sight outside the doorstep of many (mostly South Indian) Indian homes. Madhubani painting, Rajput painting, Tanjore painting, and Mughal painting are some notable genres of Indian art, while Raja Ravi Varma, Nandalal Bose, Geeta Vadhera, Jamini Roy are some modern painters. The first sculptures in India date back to the Indus Valley civilization, some of the earliest sculpture in the world. Stone and bronze carvings from that time have been found. Later, as Hinduism, Buddhism, and Jainism developed, India produced some of the most intricate bronzes in the world, as well as unrivaled temple carvings. The pink sandstone sculptures of Mathura evolved during the Gupta period to reach a high degree of delicacy. Newer sculptures in northwest, in stucco, schist, or clay, display strong blending of Indian post-Gupta mannerism and classical influence, Hellenistic or possibly even Greco-Roman. 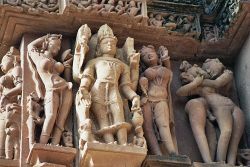 Meanwhile, elsewhere in India, less anatomically accurate styles of human representation evolved leading to the classical art that the world is now familiar with and contributing to Buddhist and Hindu sculpture throughout Asia. The music of India includes multiple varieties of folk, popular, pop, and classical music. Indian classical music traditions, including Carnatic and Hindustani music, are noted for the use of several raga, and has a history spanning millennia. Indian genres like filmi and bhangra have become popular throughout the United Kingdom, South and East Asia, and around the world. India offers a number of Classical Indian dance forms, each of which can be traced to different parts of the country. Each form represents the culture and ethos of a particular region or a group of people. The main styles are Bharatanatyam, Kathak, Odissi, Yakshagana, Kuchipudi, Mohiniattam, Bhangra, Manipuri and Kathakali. Besides, there are several forms of Indian folk dances, and special dances observed in regional festivals. Indian drama and theatre is perhaps as old as its music and dance. Kalidas plays like Shakuntala and Meghadoot are some of the oldest plays from literary traditions. The tradition of folk theatre is alive in nearly all the linguistic regions. There is a rich tradition of puppet theatre in rural India. Group Theatre thrives in the cities, initiated by the likes of Utpal Dutt, Khwaja Ahmad Abbas, and still maintained by groups like Nandikar and Prithvi Theatre. Bollywood is the informal name given to the popular Mumbai-based film industry. Bollywood and the other major cinematic hubs (Bengali, Kannada, Malayalam, Tamil, Telugu) constitute the broader Indian film industry, whose output is considered to be the largest in the world in terms of number of films produced and, possibly, number of tickets sold. Bollywood films are usually musicals, though not in the Western sense of the word. Indian movies have a regular plot, with songs and dances interspersed to add to the entertainment value of the movie. Few movies are made without at least one song-and-dance number. Indian audiences want songs and dances, love interest, comedy and dare-devil thrills, all mixed up in a three-hour long extravaganza with an intermission. Such movies are called "masala movies," after the Indian spice mixture "masala." 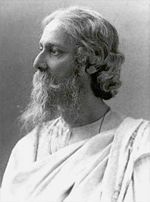 Rabindranath Tagore became Asia's first Nobel laureate when he won the 1913 Nobel Prize in Literature. The earliest literary traditions were mostly oral, and were later transcribed. Most of these spring from Hindu tradition and are represented by sacred works such as the Vedas, the epics of the Mahabharata and Ramayana. Tamil Sangam literature represents some of India's oldest secular traditions. Many Buddhist and Jain works are in Prakrit languages. The classical works of playwright Kalidasa even today exert an important influence. The Tamil Ramayana (translated from the original Valmiki Ramayana) by Kamban is considered to be a classical masterpiece. Kalidasa has been given the title of "Kavi Chakravarthi" (king among poets). India has a strong tradition of poetry, often closely related to musical traditions, and mostly attributed to religious movements. Writers and philosophers were often skilled poets. In modern times, poetry served as an important non-violent tool of nationalism during the Indian freedom movement. A famous modern example of this tradition can be found in Rabindranath Tagore, and poets such as Kabir in medieval times, as well as the epics of ancient times. Two examples of poetry from Tagore's Gitanjali serve as the national anthems of both India and Bangladesh. India's national sport is field hockey, although cricket is the most popular sport. In some states, particularly those in the northeast and the coastal states of West Bengal, Goa and Kerala, football (soccer) is the more popular sport. In recent times, tennis has gained popularity. Chess, commonly held to have originated in India, is also gaining popularity with the rise of the number of recognized Indian grandmasters. Traditional sports include Kabaddi, Kho-Kho, and Gilli-Danda, which are played nationwide. India has one of the world's oldest martial arts forms - Kalari Payattu. The most popular holidays are Diwali, Holi, Onam, Sankranti/Pongal, Gudi Padwa/Ugadi, the two Eids, Christmas, and Vaisakhi. India has three national holidays. Other sets of holidays, varying between nine and 12, are officially observed in the individual states. While poverty in India has reduced significantly, 17.59 percent (over 300 million) of Indians still live below the national poverty line. Since the early 1950s, successive governments have implemented various schemes to alleviate poverty, which have met with partial success. The "Food for Work" program and "National Rural Employment Program" of the 1980s, attempted to use the unemployed to generate productive assets and build rural infrastructure. In August 2005, the Indian parliament passed the Rural Employment Guarantee Bill, which promises 100 days of minimum wage employment to every rural household in 200 of India's 600 districts. The question of whether economic reforms have reduced poverty or not has fueled debates without generating any clear-cut answers and has also put political pressure on further economic reforms, especially those involving the downsizing of labor and cutting agricultural subsidies. Corruption has been one of the pervasive problems affecting India. It takes the form of bribes, evasion of tax and exchange controls, and embezzlement. The economic reforms of 1991 reduced red tape, bureaucracy and the Licence Raj that had strangled private enterprise and was blamed for the corruption and inefficiencies. Yet, a 2005 study by Transparency International found that more than half of those surveyed had first-hand experience of paying bribes or peddling influence to get a job done in a public office. The chief economic consequences of corruption are the loss of tax revenue, an unhealthy climate for investment and a decrease in the cost of government-subsidized services. The Transparency International study estimates the monetary value of petty corruption in 11 basic services provided by the government, like education, healthcare, judiciary, and the police, to be around Rs.21,068 crores. India still ranks in the bottom quartile of developing nations in terms of the ease of doing business, and compared to China, the average time taken to secure the clearances for a start-up or to invoke bankruptcy is much greater. The Right to Information Act (2005) and equivalent acts in the states, that require government officials to furnish information or face punitive action, computerization of services and various central and state government acts that established vigilance commissions have considerably reduced corruption or at least have opened up avenues to redress grievances. The 2010 report by Transparency International puts India at 87th place. ↑ 1.0 1.1 1.2 1.3 Know India, National Symbols. Retrieved January 3, 2017. ↑ Stanley Wolpert, A New History of India (Oxford University Press, 2003, ISBN 978-0195166781), 1. ↑ "[...] Jana Gana Mana is the National Anthem of India, subject to such alterations in the words as the Government may authorize as occasion arises; and the song Vande Mataram, which has played a historic part in the struggle for Indian freedom, shall be honored equally with Jana Gana Mana and shall have equal status with it." Constituent Assembly of India - Volume XII, Statement Re: National Anthem 24th January 1950. Retrieved January 3, 2017. ↑ This is the figure given by the United Nations, though the Indian government lists the total area as 3,287,260 km² (1,269,220 sq mi). "The country’s exact size is subject to debate because some borders are disputed. The Indian government lists the total area as 3,287,260 km² (1,269,220 sq mi) and the total land area as 3,060,500 km² (1,181,700 sq mi); the United Nations lists the total area as 3,287,263 km² (1,269,219 sq mi) and total land area as 2,973,190 km² (1,147,960 sq mi)." ↑ "India" IMF Population estimates. Retrieved July 31, 2017. ↑ Population Enumeration Data (Final Population). Census of India. Retrieved July 31, 2017. ↑ 7.0 7.1 7.2 7.3 World Economic Outlook Database, April 2017 – Report for Selected Countries and Subjects. International Monetary Fund (IMF). Retrieved 27 April 2017. ↑ Transparency International, Corruption Perceptions Index 2010 Results Retrieved January 3, 2017. Thapar, Valmik. Hu de wang guo Yindu shen mi zhi lü = Land of the tiger : a natural history of the Indian subcontinent. [Beijing]: Zhongguo shao nian er tong yin xiang chu ban she, 2003. Official India directory National Informatics Centre. India Countries and Their Cultures. Country Profile: India BBC News. India Biodiversity profile for India. This page was last modified on 28 February 2018, at 19:53.